Custom Website Clone for more flexibility. We offer a wide range of Website Clone Services to help define, like Custom Development Upwork clone, Freelancer Clone, Lyft Clone, Uber Clone, Alibaba clone and as per reference link provided by clients. We at Nakphy IT firm have experts in Website Cloning services. We all see many renowned web giants are ruling market with their different and unique ideas in different niche. Nakphy IT Firm provides the opportunity to the clients to a build a site by following them who are already leading the market and implement their own ideas into it. We provide effective services of website cloning by which entrepreneurs can imply their ideas into the existing famous websites. Our expert team of web designers develop custom clone that guide you to succeed at your business. We provide website cloning service with garden-fresh concept, innovation, and ideas driven by thorough research. The entire website cloning process we complete by looking at technological holistic approach. Any custom website should suit your specific business needs. It is vital that your website is visually appealing and draws your visitors in. Not only does your site have to capture your targeted audience, it should also reflect who you are and your business competence. Nakphy IT firm helps to create your brand identity and ensures it remains unified. We offer website cloning service and making sure your visitors get the best experience of your brand, we collaborate throughout the development project and also after to ensure that you are getting expected revenue from it, If you let us get the chance to look after on your whole technical part from web development to digital marketing. We ensure perfection on every aspect of your project. Nakphy IT Firm offers bespoke website cloning service to take advantage of the rapid growth of online platforms. 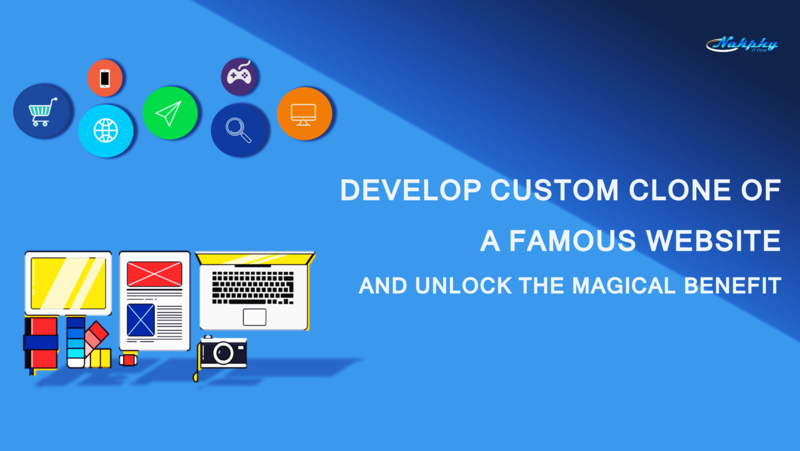 We provide custom-build scalable, dynamic design that utilize a wide variety of powerful Features that encourage new & repeat business, and rewards your customers for coming back again & again. Nakphy wants to build you a customer-engagement machine. A Custom Website Clone for your business can be just that. We make your custom more engaged to your website , by developing a high interactive clone. Unlike ready-made clones we give flexibility to our clients from Features to Design modification, as we create custom clone from scratch to illustrate and maximize your brand. We create website with updated latest technology and different platform. PHP – Codeigniter (CI), Cake PHP, Zend frameworks, Laravel, Custom PHP, WordPress. We use updated version of every platform or tool we use. Responsive design of any website is most common thing todays genre, but make it effectually is most important experts team web designers provide alluring design. Every solution we provide from Custom website design, Mobile Apps Development to Website Cloning all the tailored made services are SEO friendly to give more convenience to our each client. We do provide all the documentation such as User Manual, Product guides, Online help document we have our state-of-the-art Software Documentation Services. We understand every aspects of client, we care for each of our valued client. For their convenience we provide 3 months free support post-delivery of the project.